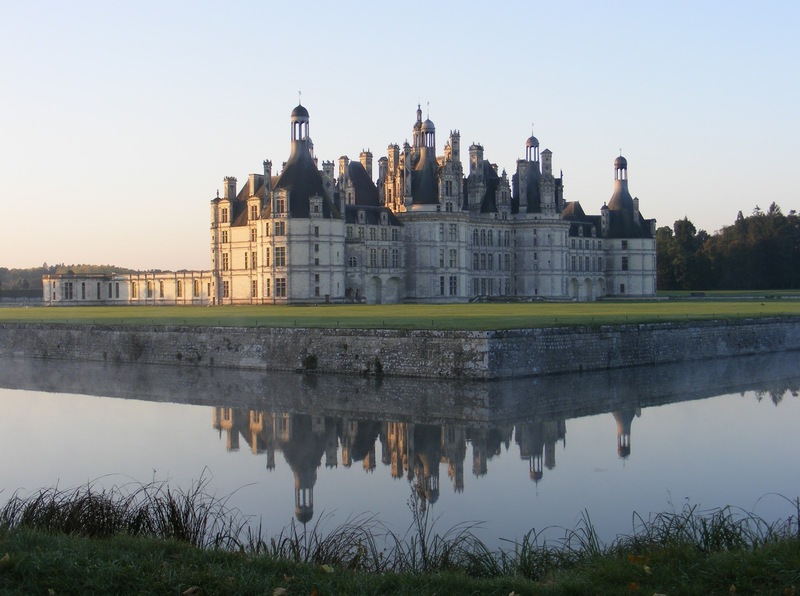 Chambord is the largest and most lavish of all the Renaissance châteaux, the forerunner of Versailles. It was once a 14th century hunting lodge, razed by the folly of grandeur of King François I. He took the medieval design of a fortress and turned it into a masterpiece of Italian-style architecture. Its construction obsessed him. When the treasury ran dry and he had to pillage the church's treasures and melt down the royal silverware, building work continued. And even when François' two sons were taken prisoner by the King of Spain and he couldn't pay the ransom, building work continued. Yet ultimately François spent only 27 nights there and died before the castle was completed. His plans called for diverting the Loire River to fill the moats, but he had to settle for rerouting the Cosson. Chambord has 440 rooms, the longest wall in France (31 km) and the largest walled-in park in Europe (5440 ha). Everything is the biggest, the brightest and the best. The most daring and innovative architecture of the time. Which is probably why the castle fascinated Louis XIV, the Sun King, over a century later when he arrived there on his honeymoon. Work began in 1519, when François was only 25 and arrogant with his first military victories. First came the central keep in the form of a Greek cross, where the courtiers lived. 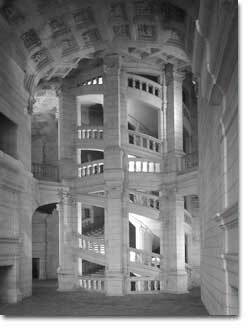 From it a staircase led upward to the terrace roof, culminating in the fleur-de-lys, the ultimate image of earthly power. It was from the rooftop terrace that the bored ladies of the court - who hated the place - watched as their gentlemen rode off to hunt in the surrounding forest, and there that they would gossip and sun themselves to drive the castle's dampness out of their bones. Still, François loved it. Thirty-five years later, he added on two symmetrical wings: one for his own apartments, the other for the chapel. A separation of royal power and divine. But who was the architect? Some say Leonardo da Vinci, who was living downriver in Amboise at that time, although he died the same year construction began. Some sketches seem to bear his mark, and the general architecture is in his style. What is sure is that the staircase was built from a design by him: a unique double spiral staircase built around a hollow core, similar to a string of DNA. But as for the rest, no one will ever know how much is due to the Great Master. 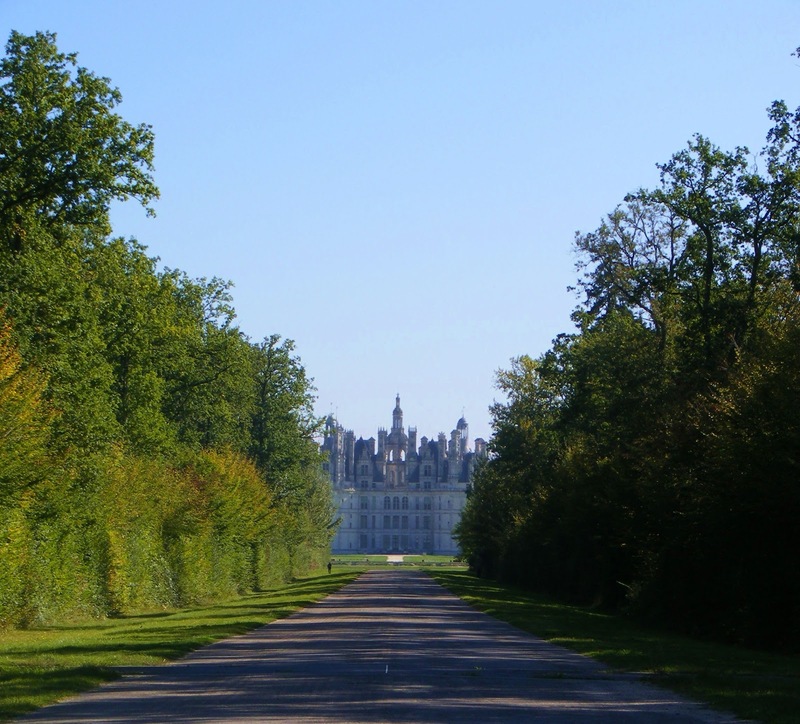 Chambord is a man's castle, intended primarily for hunters. Lots of forest and no gardens. Nothing to attract or distract the ladies. When in residence, the court endured damp, piercing cold that resisted the castle's innumerable chimneys (one for every day of the year, it’s said). Even in summer, it's cool inside. Perhaps the cold is why Chambord was inhabited only a total 20 years out of five centuries. But during those 20 years, it hosted many illustrious names. On his journey from Spain to Flanders in the 16th century, Emperor Charles V was François' guest, marveling at "what human endeavor can achieve". 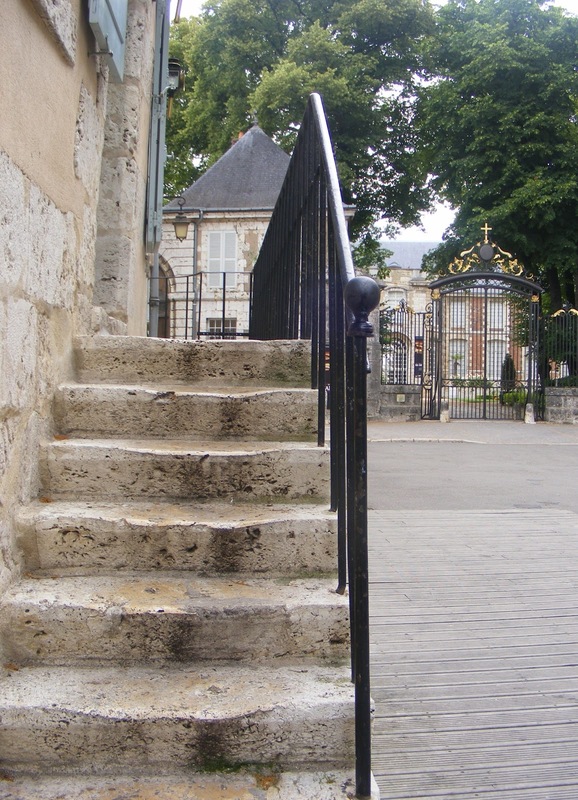 Gaston d'Orléans, the brother of Louis XIII, spent his exile here for plotting against his regal sibling, playing hide-and-seek up and down the staircase with his daughter. When Louis XIV refurbished a wing for his own apartments in the 17th century, Molière followed the court, staging several of his plays to Lulli's music. The exiled king of Poland, father-in-law to Louis XV, lived here eight years in the 18th century. And it was here that the Duke of Bordeaux, pretender to the throne, gave up his dream of riding triumphantly into Paris as Henri V, the last King of France. 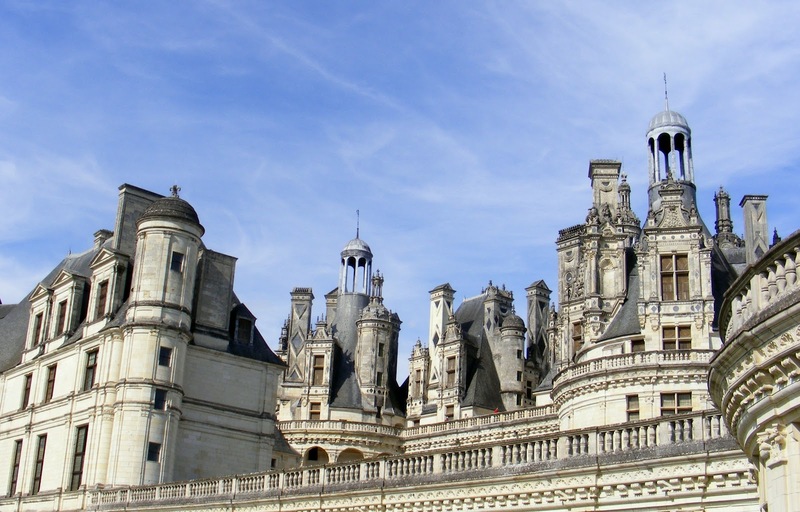 The French Revolution nearly destroyed Chambord, the symbol of the hated royalty. Its furniture was carted off and its floorboards ripped up. The government even planned to chisel away the main features of the decoration: the fleur-de-lys, the royal monogram "F", and the salamander. Luckily the undertaking would have been so expensive that the plans were abandoned. So was the castle. Why the salamander? At that period of France’s history, each king chose an animal to represent him. And according to medieval legend, the salamander has the amazing property of being able to extinguish fire without getting burned, just like the saints of the Bible. Thus François' emblem, and his motto, "I feed from the flames of good and extinguish the bad". And in case you missed the salamanders and royal monograms scattered by the hundreds throughout Chambord, François left his mark high above one of the rooftop windows in his wing of the castle: FRF: François, Roi de France (François, King of France). As if he were reminding you that he built this. Bow down, he commands. Show respect. Yes, Chambord is a huge castle, as huge as the ego of the king who built it. Any American who has lived in France for any length of time is familiar with this column that Art Buchwald penned in 1952 when he was writing for the International Herald Tribune in Paris. But for those of you who don't know it, here it is. And happy Thanksgiving! One of our most important holidays is Thanksgiving Day, known in France as le Jour de Merci Donnant . 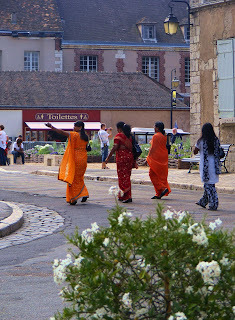 Le Jour de Merci Donnant was first started by a group of Pilgrims ( Pelerins ) who fled from l'Angleterre before the McCarran Act to found a colony in the New World ( le Nouveau Monde ) where they could shoot Indians ( les Peaux-Rouges ) and eat turkey ( dinde ) to their hearts' content. They landed at a place called Plymouth (now a famous voiture Americaine ) in a wooden sailing ship called the Mayflower (or Fleur de Mai ) in 1620. But while the Pelerins were killing the dindes, the Peaux-Rouges were killing the Pelerins, and there were several hard winters ahead for both of them. The only way the Peaux-Rouges helped the Pelerins was when they taught them to grow corn ( mais ). The reason they did this was because they liked corn with their Pelerins. In 1623, after another harsh year, the Pelerins' crops were so good that they decided to have a celebration and give thanks because more mais was raised by the Pelerins than Pelerins were killed by Peaux-Rouges. "Go to the damsel Priscilla ( allez tres vite chez Priscilla), the loveliest maiden of Plymouth ( la plus jolie demoiselle de Plymouth). Say that a blunt old captain, a man not of words but of action ( un vieux Fanfan la Tulipe ), offers his hand and his heart, the hand and heart of a soldier. Not in these words, you know, but this, in short, is my meaning. "I am a maker of war ( je suis un fabricant de la guerre ) and not a maker of phrases. You, bred as a scholar ( vous, qui êtes pain comme un étudiant ), can say it in elegant language, such as you read in your books of the pleadings and wooings of lovers, such as you think best adapted to win the heart of the maiden." Although Jean was fit to be tied ( convenable à être emballe ), friendship prevailed over love and he went to his duty. But instead of using elegant language, he blurted out his mission. Priscilla was muted with amazement and sorrow ( rendue muette par l'étonnement et la tristesse ). No one can deny that le Jour de Merci Donnant is a grande fête and no matter how well fed American families are, they never forget to give thanks to Kilometres Deboutish, who made this great day possible. Every year of my ex-pat Paris life, I hosted a Thanksgiving dinner. I invited my American friends, of course, but also guests from other nations: fellow students from behind the Iron Curtain (a world totally foreign to me), Africans I'd met at UNESCO, islanders from the Caribbean from whence came my children's father... and even a smattering of British (I don't hold a grudge.) We would take the door off its hinges, after removing the doorknob, and use it as a table to seat everyone - usually somewhere around 30 people. The turkey - hard to find in November in France - was cooked downstairs in the friendly baker's oven because mine wasn't big enough. Harry mixed up the egg nog, Melinda baked the corn muffins, someone pre-tossed a green salad, somebody else brought some cans of corn (which were pretty hard to find in the early years)... and I pretty much did all the rest: cranberry sauce (another challenge to find cranberries), wild rice, candied yams, stuffing for the turkey and my grandmother's delicious clam chowder from scratch. Many languages were spoken. Many bottles of wine gave up their lives. And a generally excellent time was had by all. It makes for wonderful - albeit exhausting! - memories. So eat hearty, and Happy Thanksgiving everyone! 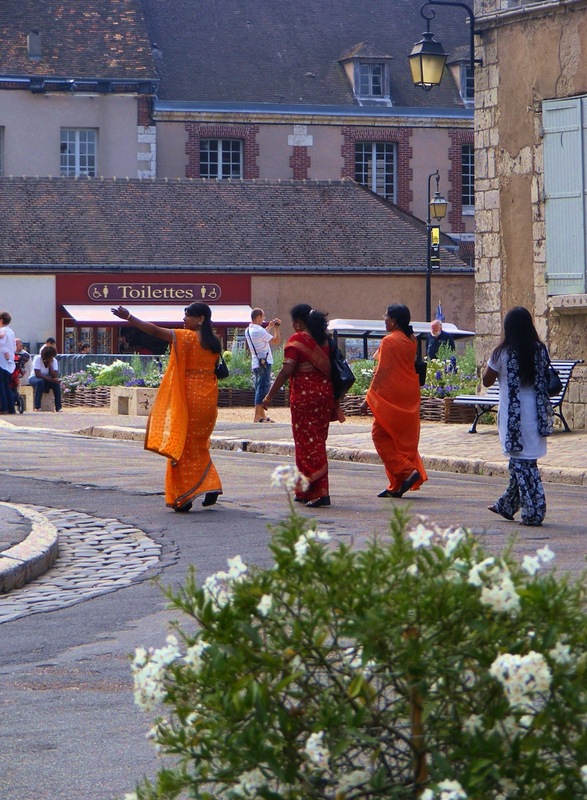 The region around Paris is rich in culture and beauty. 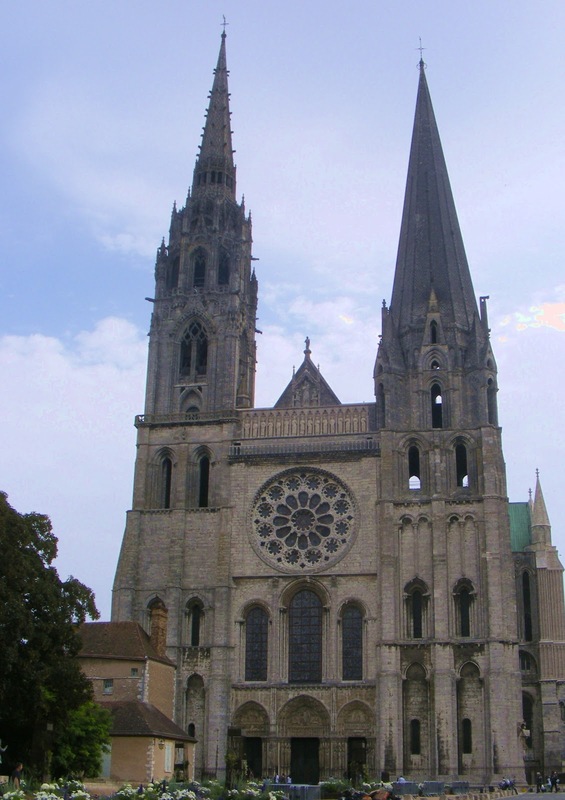 Among the cities within an hour's drive or a short train ride is Chartres, with its splendid cathedral towering over the wheat fields of La Beauce, the granary of France. 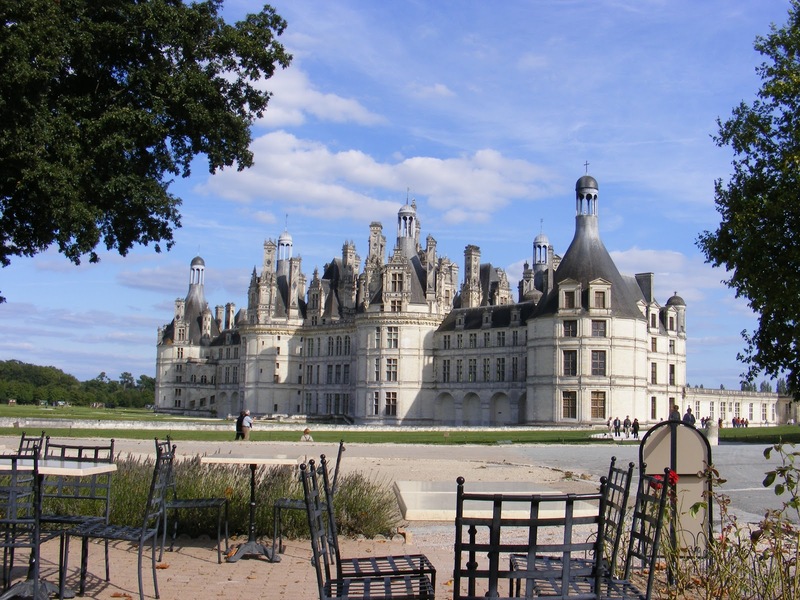 Lying between Paris and the Loire castles, the city was of major historic importance; France's only Protestant king, Henri IV, was crowned here in 1594 after converting to Catholicism. 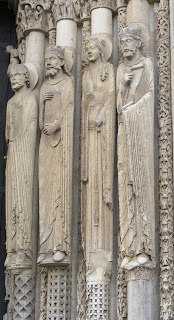 Many legends also surround Chartres, stretching back to the days when it was a major Celtic city where Druid priests held ceremonies around a well which now lies under the cathedral's crypt. Later came a Gallo-Roman temple where a statue of a mother-goddess was venerated. Early Christians saw it as the Virgin Mary and moved it to their basilica, where "Our Lady Underground" guarded all subsequent churches until it disappeared in the French Revolution. In 1360 the Virgin protected Chartres from the siege of England's King Edward III with a hail storm, and again in 1587 from the Huguenot Prince du Condé who unexplainably retreated after his cannons made a breach in the city's ramparts and victory was within reach. The present-day Cathedral of Our Lady, Notre Dame, stands at the highest point in the city, on the site of five previous sanctuaries destroyed by fire. 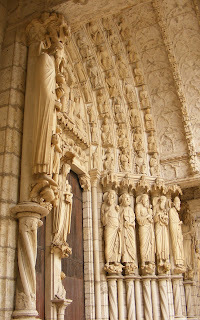 It dates from the mid-13th century, the height of Gothic architecture, and is unique in its unity, perhaps because it took only 25 years to build. 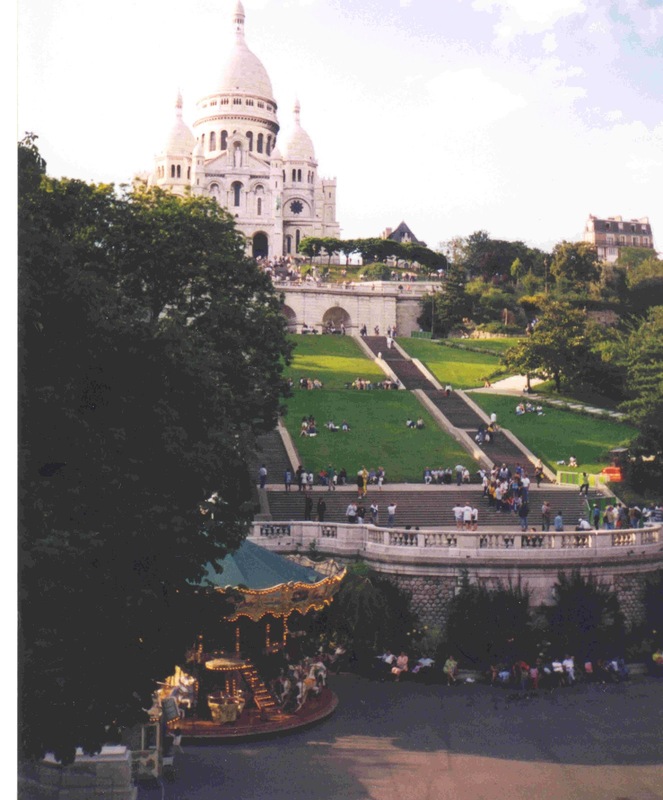 The sculptor Rodin called it the "Acropolis of France"; UNESCO lists it as a World Heritage treasure. Also unique are the cathedral's asymmetric spires: a shorter, simpler romanesque masterpiece on the right; a taller, flamboyantly rich Gothic spire on the left. 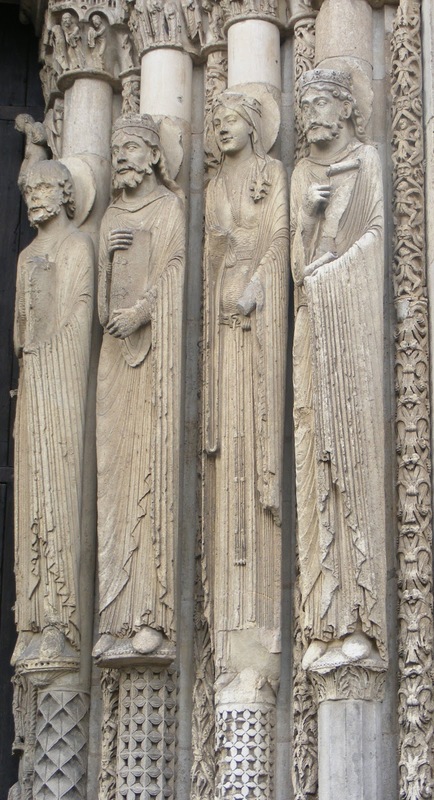 The sculptures that grace both this Royal facade and the south facade are wonders of romanesque art, and while they depict Christ's life and the Last Judgment, the many Biblical kings and queens portrayed are probably modeled on the princes, barons and rich bourgeois merchants whose generosity built this monument to Christian faith. 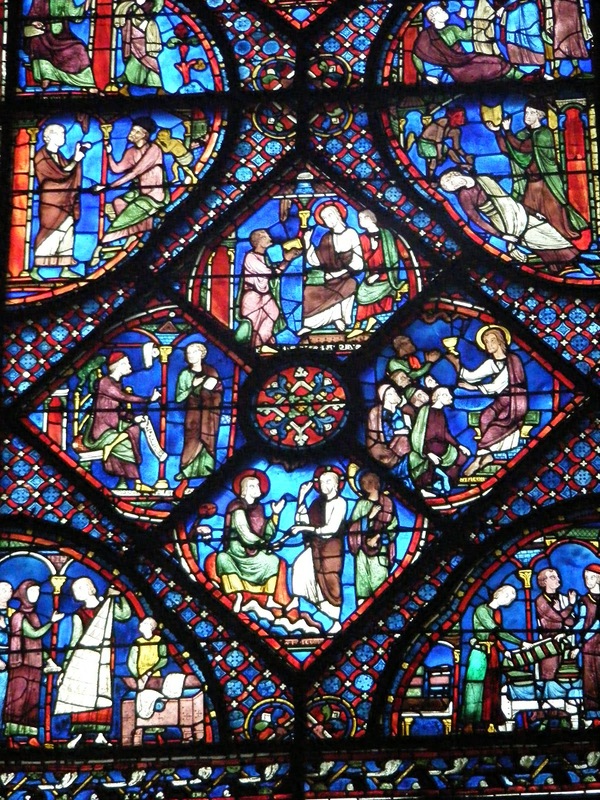 Light flows in through three magnificent rose windows facing north, south and west, and many more 12th and 13th century stained glass windows of unrivaled beauty, their distinctive blue named after the city. 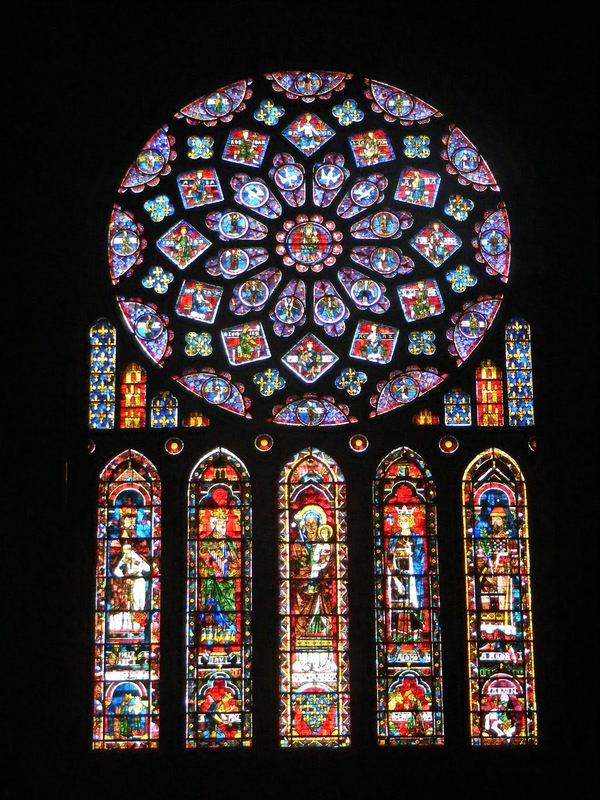 To be visible from afar, the figures of the upper windows are large, while the lower windows (one offered by the American Association of Architects in 1954) have more intimate medallions of the trades that created them. 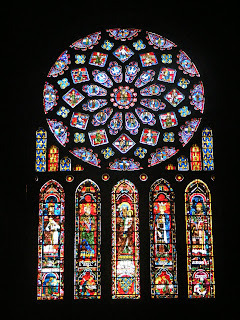 Some, like the window of St. Jacques behind the main altar, have been restored recently by months of painstaking labor. There is one place in the cathedral where Christianity meets paganism: the labyrinth. The center of its black and white geometric design marks one of the world's strongest points of telluric current, a force worshipped by the Druids, and at the summer solstice pilgrims from around the world follow its 294 meter long maze on their knees as they pray. 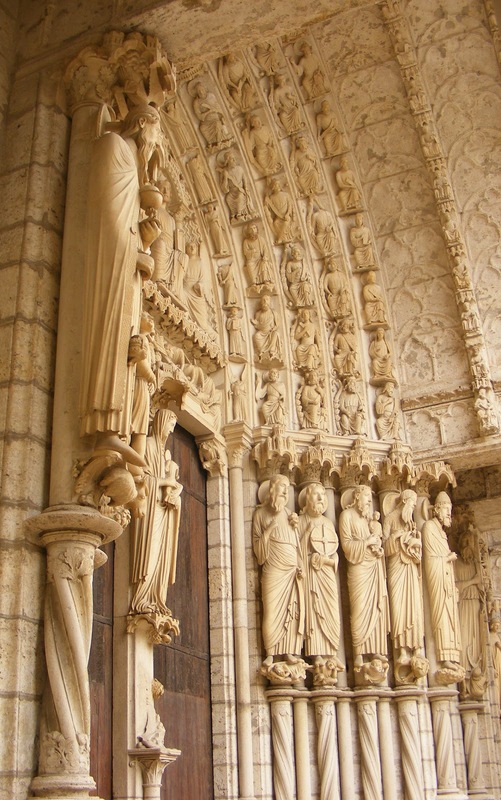 But although the cathedral is the gem of the city, there are other points of interest, such as the Musée des Beaux-Arts in the 17th century bishop's palace. This museum, which also schedules concerts, boasts a wide range of artwork: tapestry, medieval polychrome wood sculptures, a Vlaminck collection, a Celtic mask from the first century and a Tahitian tiki. 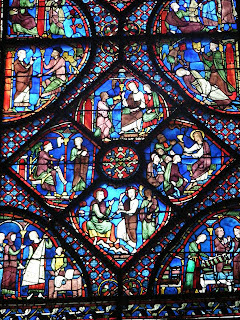 Tucked away north of the cathedral in a former stables is the International Center of Stained Glass, where fascinating displays explain how stained glass is made and colorful temporary exhibits spotlight works by selected artists from different countries. Many narrow streets wind up and down the hill where the cathedral stands. 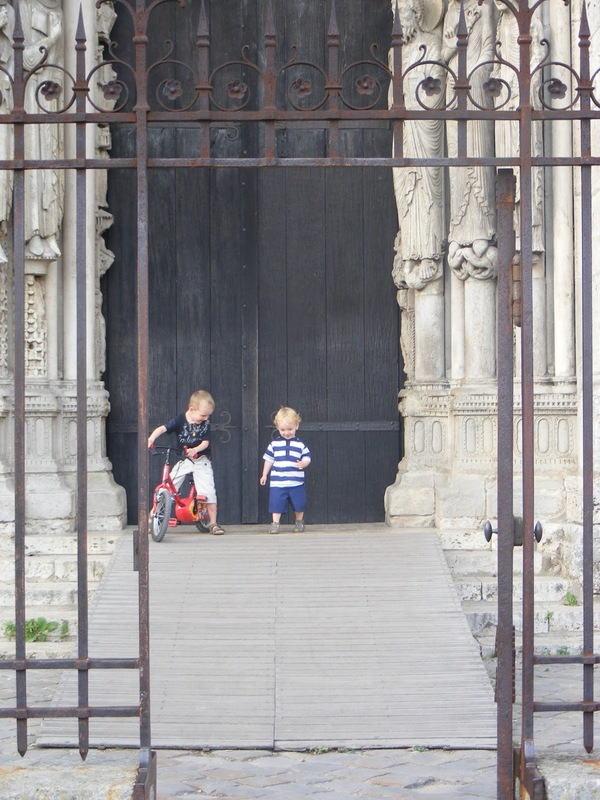 A short walk will take you to the market (Chartres has been a market town for centuries) where you can buy food for a quiet picnic on the ramparts behind the cathedral with a view over the three branches of the Eure River below. Or try La Truie Qui File (The Spinning Sow) restaurant in a 15th century half-timbered house, where the menu features fine local cuisine. 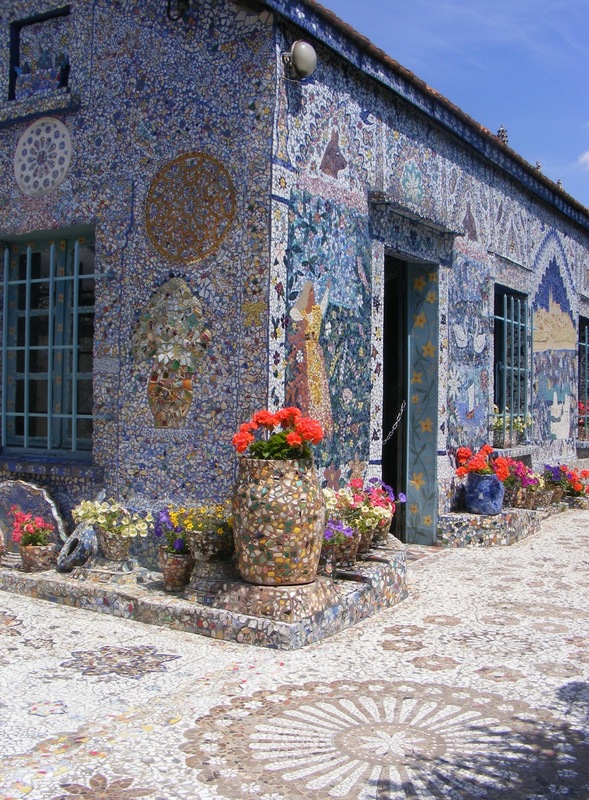 On your way home, don't miss la Maison de Picassiette, a house built by a dreamer, where everything is decorated with colored shards of glass, mirror and crockery: garden, walls, furniture, even an old Singer sewing machine. Over 30 years of work to build a strange but striking creation unlike any other. Note: I wrote this article in 1995. Since then, La Truie Qui File restaurant has closed, much to my chagrin. But the 16th c. building has been restored and the city of Chartres has transformed it into the Tourist Office. So the delicious meals are gone, but the upside-down sow is still spinning and the salmon that once hung over the fishmonger’s is still there. 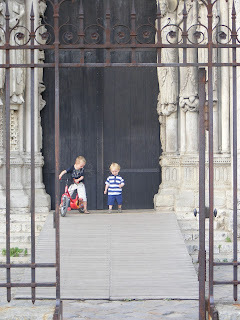 Chartres is 77 km (48 miles) from Paris and there are many trains daily. The trip takes about an hour and then it's just a 15 minute walk to the Cathedral, albeit uphill. It's an easy stroll around the center of town, with lots to see and window displays that will call out to your wallet. If you want to stay overnight, there are several hotels to choose from. First of all, before anything else, you will want to know how the heck this is pronounced. Well, that’s easy. It’s pronounced "flahm-koosh". Although I’ve heard it many other ways as well, so don’t let pronunciation keep you from making it. And when people ask what it is, you can tell them, just like that: flahm-koosh. This recipe comes from Alsace in the east of France (even though it’s also on the menu of restaurants in the north near the Belgian border). It means flaming tart, or more specifically a "pie baked in the flames." It was traditionally made to test the heat of the baker’s oven before he started baking the bread. Flammekueche is one of the most well-known specialties of Alsace. And of Germany as well, right there on the opposite bank of the Rhine. Alsace sits on France’s border with Germany (and Switzerland) and stretches north/south along the Rhine River. Over history, it has been part of both countries, and before that part of the Holy Roman Empire. In my early years in Paris, the wife of the baker near my apartment was from Alsace. She told me about being born in Germany and then becoming French, all without leaving her native town. That’s because Alsace, which had been part of France since the 17th century, was conquered by Germany in the Franco-Prussian War and given back to France only at the end of World War I. So Mme. Prandy had been forbidden to speak French when she was a child, then forbidden to speak German as a young woman... but she could always speak Alsatian, which is actually more a form of German than anything else. In addition to the language, the cuisine of the region is also very heavily accented in German. That means a lot of pork. 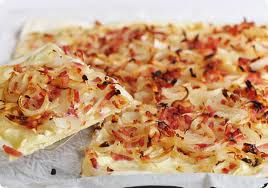 And the traditional flammekueche involves thick-cut bacon and onions and cheese on a thin crust. So it’s very much an Alsatian pizza. As a matter of fact, it was basically a home-cooked dish until the pizza craze swept France in the Sixties. Mushrooms can be substituted for the bacon, if you want a vegetarian version, and Munster cheese for the usual fromage blanc. But unlike a pizza, it’s usually rectangular in shape. The dough is just a pizza dough. To make this easy dish even easier if you’re running late or just don’t feel like being Julia Child-ish, you can use a ready-made pizza dough. Be sure to roll it out very thin. It’s perfect for a dinner among friends on a cold day. - Heat 1 T of the oil in a skillet. Add the onion and cook over low heat, stirring, until golden brown (about 5 min). Let cool a bit. - Combine the crème fraîche, cheese, salt, pepper, and nutmeg. Add the cooled onion. - Heat the remaining oil in the skillet and fry the bacon until lightly browned, stirring constantly. Remove and drain on paper towels. - Oil a 14 x 16 inch baking sheet. Roll the dough until it’s slightly smaller than the baking sheet. Place it on the sheet and spread the onion mixture over the dough, leaving a very small raised rim all the way around, then dot with the bacon. - Bake for 15-20 minutes, or until the tart is lightly browned. Serve immediately. Accompany with a crisp green salad and serve with beer or a fruity white wine. NOTE: If you can’t find crème fraîche, you can make your own by combining 1 cup heavy cream with 2 tablespoons buttermilk, stir, cover with plastic wrap, and leave at room temperature for 12 to 24 hours, or until it has become very thick. Refrigerate and it will become even thicker. It can be used for lots of other recipes, such as pepper steaks (steaks au poivre) or veal scallops with mushrooms (veau à la normande).